I have a question for you. On your relationship priority list, who’s #2 after God? Your spouse or your kids? For me, it’s my husband Ted. 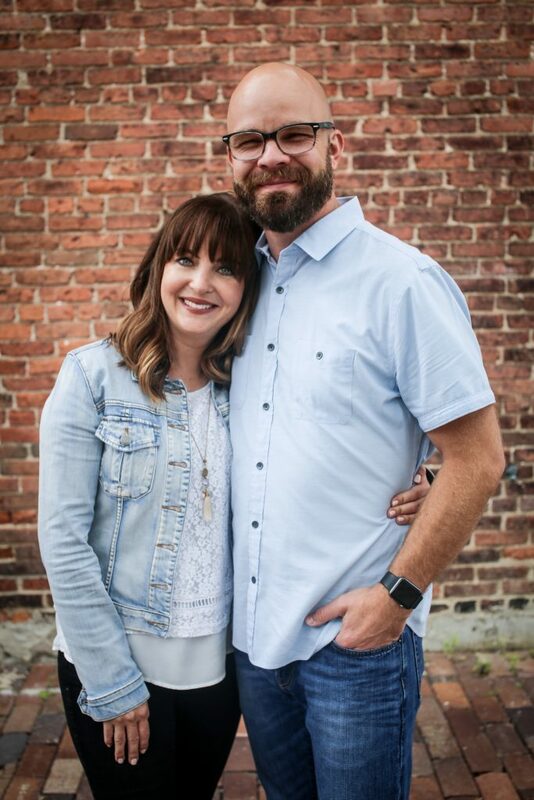 Not too long ago I wrote about this in an article titled, “I’m 49% Mother and 51% Wife – And It Has to Be That Way.” Within hours of it publishing, it became clear to me that this idea of marriage before kids is a divisive one. In the comments I received (primarily on Facebook), there really was no middle ground. There were the “I completely agree with you” people and the “I can’t believe you’d put the needs of a grown man before a child” people. But what caught my attention as I read people’s thoughts were the questions. The ones from wives who desperately wanted to make their relationship with their husband a priority, but weren’t sure how to do it on a day-to-day, practical basis. Specifically those with young children. As someone who’s spent the majority of my twelve years of marriage with one or more kids in diapers, I get it. After all, how do you make your marriage a priority when you’re nursing babies, chasing toddlers, sleep deprived, and only showering twice a week? For Ted and me, it was a process of learning as we went. What did we discover? 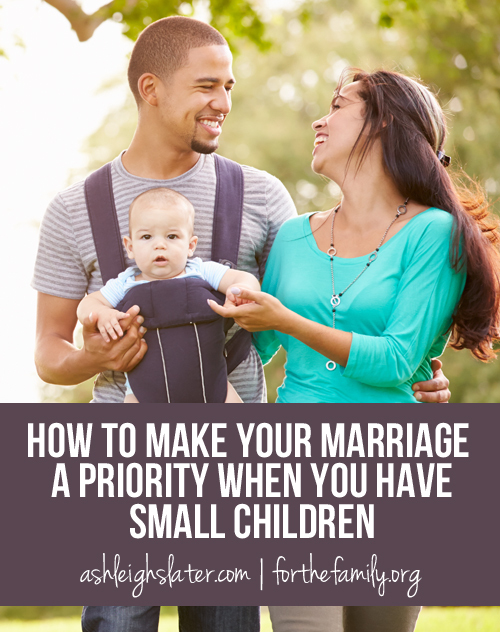 Well, here are three practical ways we managed to keep our marriage in the #2 spot when we had small children. It’s easy to default to a “Let’s try to find time for our marriage” mentality. Here’s the thing, though: There will always be something or someone clamoring for your attention. Whether it’s dishes, laundry, or a two-year-old. So stop waiting until you can find time. Instead, actively make time together, even if it’s as little as 10 minutes here and there. What are some simple ways you can do this? Have coffee together in the morning while your toddler or preschooler watches Disney Jr. or PBS Sprout. Save chores like the dishes or folding laundry to do side-by-side. Put the kids in the stroller and take a walk together after dinner. Or, as Ted and I have done, make after their bedtime your time. If you and your spouse are both home in the evenings, being strict with bedtimes is a practical way to make time together. Once your kids graduate out of the newborn and early infant phases, set an early-in-the-evening bedtime for them and be consistent with it. Things and even relationships will get neglected. They just will. But you can be intentional to make sure your marriage isn’t one of those. One way to do this is by deciding in advance what things to neglect. For me, housekeeping and cooking fell into these categories. While I valued a clean house, I didn’t put scrubbing the bathroom before time with my husband. We also ate a lot of quick, easy meals rather than more labor/time-intensive ones. What things can you move further down on your priority list in order to make more time for your marriage? 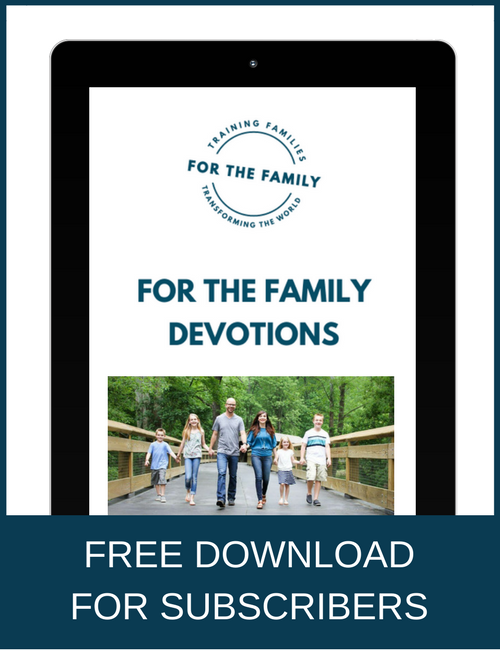 You don’t have to wait until your kids are potty trained, in big kids beds, or even off to school to make your marriage #2 on your relationship priority list. Like Ted and I found, you can do it in the trenches of parenting small children. It just takes a little bit of planning. I work full time out of the home start at 5 a.m. and work until 3 p.m. I have an 18 year old, 16 year old, 11 year old and 9 mth old any tips for “us” time? Already I am torn between my 3 older kids activities and getting up at 3 a.m.
1. I think #1 in this article is something worth trying. Even if it’s a short amount of dedicated time each day, it makes a difference. Maybe you can get your teens to hang out with your 9 month old and you and your husband can take a walk, or sit on the porch and drink a cup of coffee, or do something that allows you to connect. 2. With our kids, we limit activities. We allow them to have some, but not so many that we’re always running. And I do realize this gets harder the older they get. Maybe consider putting a limit on extra-curricular activities, if possible. Or asking the older ones to help shuttle the younger ones. 3. Start small. Maybe coordinate it so you and your husband take lunch breaks at the same time. Then make a commitment to call each other or even Facetime during part of that lunchtime break. It’s not ideal, but at least you are connecting. Those are just few thoughts. Take them or leave them depending on how they may or may not work with your life season. If there are other parents reading who have thoughts and suggestions for Shellie, I’d love to hear them! Ashleigh I don’t work outside the home and my husband is gone a lot so finding “us” time is really hard…we have 8 children now 14, 11, 10, 9, 7, 3, 1/1/2, and 3weeks…so time is always limited especially since I cook organically which requires a lot of extensive home cooking, and I garden so we can save on buying so much at the store…we are 35 years old and would love advice on finding “date night” times for us. Liz, can you get the older kids to help you out with the cooking and gardening or with the younger kids? This may help free up a bit of time. Or, does your husband enjoy either of these things? If so, maybe you can cook or garden together. It may not be an official “date night,” but it would offer times of connection for you. And connection is really what I’m encouraging. I love the idea of 7 p.m. bedtimes and it’s been tried. You say even when small. How do you handle that because they subsequently awaken at 4-5 a.m. and the mother is nowhere near ready to get up that early?! Gerri, how old are the kids? That makes a difference on what I might suggest that’s worked for us personally. This is a beautiful article. Even though I am still struggling on no. 2 to establish bedtime for our 2 and 3.5 year old, I can tell that the effort to make some ‘us’ time has helped our relationship with my husband. I have a 2yr old & a 3week old. My husband has been feeling left out & the thought of adding me returning to work into the juggling act is overwhelming. He put our son to bed and I was feeding the baby – of course she threw up all over me to ad emphasis to your article! ? My husband worked from 7:30 am until 9:30 pm last night. He normally doesn’t work that late but it’s becoming more and more frequent. We have 3 children, 11, 9, 3 and one on the way. Normally we both work, but i will be staying home from now on. We have decided that with our 4th child on the way, one of us needs to stay home. When my husband got home last night he was obviously exhausted! I had gotten all of our kids to bed and was in the shower when he got home. He jumped in the shower with me and we chatted as we both washed up. It was nice to have that intimacy and be able to catch up on how each other’s days went. After the shower he went up to bed to read his bible a little and wait for me. I came up shortly after and cuddled up to him as he read from his bible. Sometimes one of us will read out loud so we both can benefit. But this night he was so tired that he only read for 5 minutes after i came to bed. After this, it was lights out and we chatted for a little bit in the dark as we cuddled and held hands. It lasted for about 5 minutes before we were both out like a light. I know it doesn’t seem like much, but when that’s all you have, it can make a world of difference in your relationship. When my husband is around, i try to put everything else out of my mind like social media, my phone, sometimes i won’t even answer a phone call from a friend unless i know it’s something important…because i want him to feel like he is #1. And i really think that helps our relationship a lot. We don’t get date nights a lot. But we both understand that we have a large growing family and we have to make the most of our time any opportunity we have!